The Combo™ encompasses five processes - feeding, sizing, sand washing, stockpiling and complete integrated water management which is a first for the industry and an important innovation to address a challenge faced by all customers of wet processing systems. 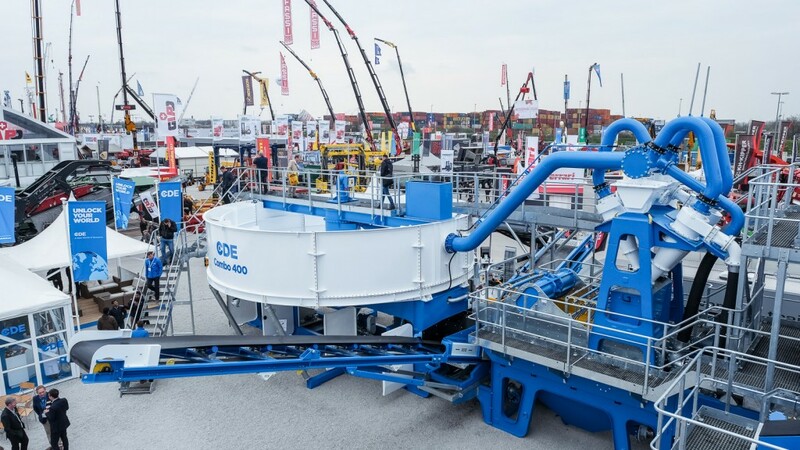 The patented Combo™- the world's first all-in-one wet processing plant - was unveiled at bauma in Munich, the leading trade fair for the construction machinery and materials industries. Sean Kerr, Chief Operating Officer, CDE said: "The Combo™ is no ordinary machine but rather a technological response to the challenges faced by materials producers. It has been designed with a focus on transferring greater reliability and efficiency benefits to customers. Offering a turnkey solution that delivers unrivalled control of in-spec washed products from a wide range of feed materials the Combo™ can be used in the construction, C&D waste recycling, industrial sands, mining and environmental sectors." In addition, the new technology allows customers almost total independence of water supply with up to 90% of process water recycled for immediate re-use in the system - ideal for jurisdictions with limited resources or those with existing environmental or impending environmental legislation. Kevin Vallelly, Director of Engineering at CDE, said: "At CDE we are unlocking a New World of Resource and driving alternatives for sand production. Global demand for construction sand is more than 15 billion tonnes per year. Sand accounts for 35% of concrete which is used in the building construction industry. Large parts of the world face increasing demand for infrastructure and civil projects in the face of diminishing natural resources. "Our sustainable technology producing washed and graded manufactured sand is helping supplement natural sand which is a finite resource and increasing in cost. By utilising normally low-value crusher fines for sand production we can extend the life of natural resources and add huge commercial value to our customers' enterprises. The Combo™ requires a small supply of fresh water compared with traditional systems which typically consume 10-15 times more water allowing its deployment in quarries and urban areas not previously known for sand production. In addition, sand can be produced closer to where concrete is required resulting in significant cost savings in the transport of aggregates. The Combo™ is industry leading technology designed to unlock a New World of Resource essential to protect our environment and build the world of the future."